Always a crowd pleaser, the Dady Brothers are a versatile duo -- playing the fiddle, mandolin, guitar, bodhran, banjo, uilleann pipes, harmonica, and even pennywhistle. The series includes ten outdoor concerts Thursday afternoons at 12:10pm during June, July and August. Weather permitting, they will be held in the Granite Mills Park near the Pont de Rennes Bridge and will feature a diverse mix of musical artists and instructors. Attendees are encouraged to bring their own seating and lunch, or pick up a great lunch area restuarants (like La Luna, and Fina's Cafe﻿). Each performance runs approximately 45 minutes. The August 1 concert features The Dady Brothers. 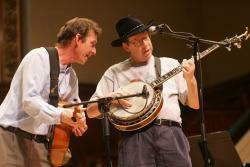 John and Joe Dady perform folk, Irish, bluegrass, and country music on a variety of instruments, including fiddle, mandolin, guitar, and bodhran. DUE TO THE WEATHER THE CONCERT WILL BE INSIDE AT CENTERS AT HIGH FALLS (60 Browns Race).